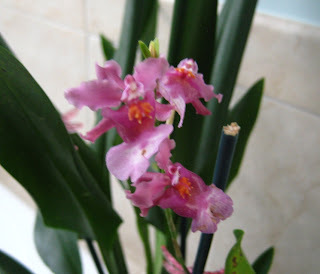 For Valentine's Day Steve gave me a beautiful Oncidium orchid. It flowered for another week or two afterward and since then has looked green and somewhat happy sitting on the tub. Steve has given me an orchid before and I kept it alive for a while, but orchids have a reputation for being finicky. I don't turn on the exhaust fan when I shower so it will have 15 minutes of humidity. I water and fertilize it when I think about it, but not as much as suggested, and I even knocked it over a couple weeks ago, spilling bark pieces into the tub. Ugh. It's not the long branches laden with dozens of blooms that I brought home from the greenhouse in February, but I'll take it. Maybe it's one of those plants that flowers when it thinks it's going to die, kind of like a last-ditch effort to procreate.